The 1st Ewha International Students Day was successfully held in the Lee Sam-bong Hall of the ECC building on Tuesday, September 18, 2018. The Office of International Affairs (Vice President Choi, Won Mog) arranged the event for the first time this year with an aim to boost a sense of belonging and fellowship of international students studying at Ewha. 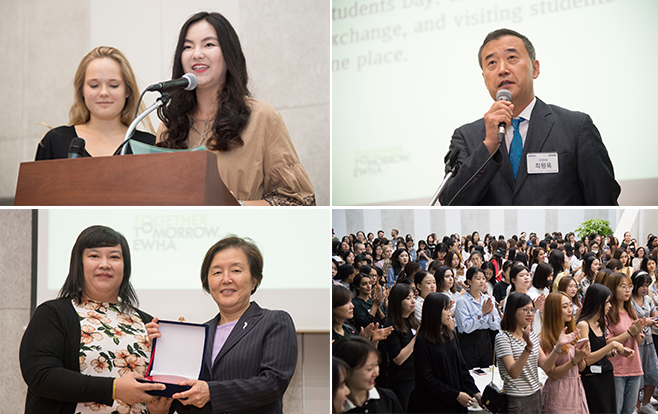 On the day, an awards ceremony was held for international students who made a great contribution to building up a strong reputation of Korea and Ewha and there was a time to retrace the course of the school’s efforts to lead globalization. President Kim, Heisook said in her welcoming address, “Our international students are at the center of the world’s women’s higher education history that Ewha will make further, and through you, we will try to give back to the world the fruit of love we have received, by expanding mutual cooperation and exchanges crossing boundaries between countries and regions.” Zhou Yubo, a representative of the Korean branch of people.com operated by People’s Daily of China also delivered a congratulatory message, saying “Korean university education promotes a free academic atmosphere while requiring high standard of scholarly attitudes including profound theoretical exploration and critical mind and thinking, and therefore, international students need to quickly adapt to this learning environment to produce successful academic achievements.” She also asked students to make this time studying in the overseas country as a valuable opportunity to cultivate multicultural communication abilities. The highlight of the whole event was the Ewha Award for Global Ambassadors, in which Professor Supaporn Boonrung (37) in the Department of Korean Language at prestigious Chulalongkorn University in Thailand, was gladly honored to be the first winner of this award. Professor Supaporn Boonrung obtained Master’s degree and completed Ph.D. course from the Graduate School of International Studies (GSIS) at Ewha University as a scholarship student invited by the South Korean government. Returning home, she was appointed as a professor in the Department of Korean Language at Chulalongkorn University in 2007, and since then, she has made a considerable contribution toward education, research, and dissemination of the Korean language. In addition, she was a member of the Multilingual Dictionary Compilation Committee of the National Institute of the Korean Language and a member of the Korean Language Textbook Compilation Committee for Thai middle and high school students. Supaporn Boonrung had a distinction to win Companion (Fourth Class) of the Most Exalted Order of the White Elephant from the King of Thailand. Following the award ceremony, there was a time to listen to thoughts of international and exchange students on this event, and the event was wrapped up with a giveaway and a banquet. Before the event, a space for cultural exchanges with traditional costumes, ornaments and foods was prepared in the Multipurpose Hall of the ECC building by international student associations of different countries including Malaysia, Vietnam, Japan, China, Thailand, and Hong Kong and Ewha Mate, a mentor group for international students.